A little more than a year ago, I set out to read the Bible from cover to cover--front to back--all the way through. I had read various pieces and parts of the Bible in the past, especially where the readings were included in our liturgy at church, but I'd never been able to say I'd read it all. My method for reading the Bible, from cover to cover, was somewhat an unorthodox one. 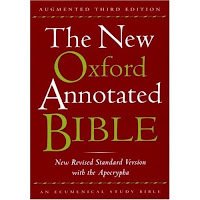 Most clergy and scholars recommend reading it as a reference, skipping around to get the interconnected meaning and greater revelation. However, my goal was, again, to be able to say that I'd seen all of it, and nothing would hide from my view. I also sought justification for my own personal beliefs, and found new meaning from which to draw some new beliefs. Today, then, is a milestone for me. I have completed the Old Testament. Whoa. What a weighty accomplishment that is! In my Oxford Bible, it represents 1375 pages of text. This is a huge volume of literature by any measure, and with my snail's pace reading skills, it took me quite some time. The first five books, the Pentateuch, are familiar to almost all of us Jews and Christians as the creation story of Genesis through Exodus, Leviticus, Numbers and the rules for living in Deuteronomy. Then, we move into the Historical books of Joshua, Judges, Ruth, 1 & 2 Samuel, 1 & 2 Kings, 1 & 2 Chronicles, Ezra, Nehemiah, and Esther. After these, the Poetical books form some of the prettiest writing in the Bible, as much of it served as the ancient hymnal for the Jews: Job, Psalms Proverbs, Ecclesiastes, and the Song of Solomon. The final books are the major and minor prophets: Isaiah, Jeremiah, Lamentations (of Jeremiah), Ezekiel, and Daniel being the major ones, and Hosea, Joel, Amos, Obadiah, Jonah, Micah, Nahum, Habakkuk, Zephaniah, Haggai, Zechariah, and Malachi being the minor ones. The Jews are given the kingdom of God. Then, they lose their way, and the prophets scold them to "make right your ways." Time and time and time again, from Genesis to Moses to the descendants of David, the people endure this cycle of being "right" with God, and then falling out of favor through their own sinfulness. There is a LOT of repetition here, and we see the Jews inherit the land of Judah, then that land split into the two kingdoms (Judah and Israel), then that land invaded by Assyria, and then invaded again by Babylonia, and then once more by Persia. All of these invasions are interpreted by the prophets as the hand of God on his sinful people. Finally, under Persian authority, we see the triumphant return of the Jews to Jerusalem and the new temple rebuilt. In the Christian doctrine, all of this is with an eye to the coming Messiah, who will permanently "put things right" with God's peoples. Of course, it is hugely inadequate to try to summarize almost 1400 pages of sacred text into a single paragraph, but there you go. If you want more, you'll have to read it for yourself! As for me, I've been steeping in the "BC" aspect of my religion so long now, I'm actually quite anxious to get into a little "AD"! Onward! That is awesome, Scott. I commend you for taking on the task. I read from cover to cover after grad school and am so glad I did. We did not have a church home at the time and it helped me connect to my faith in a different way. Now that we teach 1st and 2nd grade Sunday School, I can say with certainty that I much prefer to teach and steep myself in the N.T. The O.T. to me was a great history lesson, but the N.T. is where I live. Both important and providing different points of references for my living faith today. well done, nice summary. in fact probably one of the most succinct i've read. Congratulations on completing the Old Testament! You discussion of the reading was great. I thought I would do the same thing when I was younger and never made it through. So, I know how hard a goal it is you set and how focused you had to be to complete it. Good work! Yes, I have been very enriched by what I am reading. I am so moved by the examples that Jesus Christ showed in his love for others-especially the poor (Matt 5), his eschewing of wealth (Matt 19:21-24), his passion for following the 10 commandments (Matt 15:19-20, Matt 19:16-19), and his undeniably beautiful sacrifice (Matt 27). I'm only quoting Matthew at this point, because I'm still working on Mark, Luke and John. But my journey through the Old Testament has prepared me very well for my current study in the Gospels. I read the bible when I was in high school, and it really struck me how profoundly alien the mindset of society was at the time: cruel and rather vicious by my standards. The new covenant was sorely needed. And one could suppose that people are now allowed to wear wool-cotton blends, but sometimes I'm afraid to try, lest someone stone me. But as you so appropriately point out, we as a society pick and choose our favorites to stick by, and conveniently ignore the ones that we deem "archaic" like the wearing of two fabrics (Deut 22:11), or regarding nocturnal emissions (Deut 23:10), or punishing rebellious children with death (Deut 21:18), or the eating of shrimp and pork (Deut 14:3). So, my God tells me to love you, and I do. My conscience tells me to accept you, and I do. And if there's a God waiting for me when I die, let Him be my judge, no one else. Wow, you guys get so serious. Jesus Says the greatest commandment is to love God and to love you neighbor... If that is the greatest, why do we do such a lousy job at both. That's why their is such a disdain for Christians and more fundamentally conservatives. We water down the gospel and the life of Jesus with our own agenda and humanistic agenda and desire. It is easier to say you are bad and wrong, so that you won't look at me... I see it in my church and in many others. The Challenge as Pastor, Christian and someone who cares is to live the love Jesus brought, fight against hatred, legalism, and bigotry on both sides and change peoples lives. I hope and pray that when we work together for the greater good, put away past pain and look to tomorrow together we can transform the world with the grace, love and mercy of Jesus Christ. Now stop being so serious. My favorite is from chapter one of Genesis. The creation story is so powerful to me, I read it over and over. When God finished Creating humanity God saw it was Good, So very Good!! and yet we view it from our own bias and distort the image of God. I pray for the eyes of my creator every day.